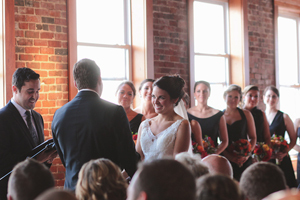 I love photographing weddings in New England. I get the best of all worlds! 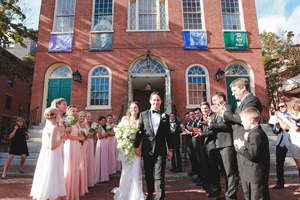 Casual beach weddings, modern city weddings, country farm weddings, but really there are so many unique and historic estates and other places you can get married in and around Boston. Since 2015 marks my ten year anniversary of being in business, I have been thinking back on some highlights and my favorite places to shoot at so far. I'm going to do a quick round-up of them here. I've been to the Crane Estate a few times for Engagement Sessions, not yet for a wedding, but I'm hoping, someday! I can't say enough about how amazing this venue is... Just breathtaking with the view from the mansion down over the rolling hills and to the sea. So dramatic. We were able to photograph Heather and Tom's session here at just the right time of evening to catch that golden light. 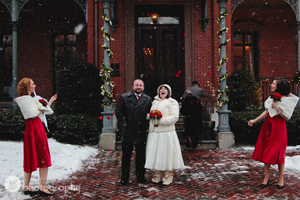 Just a hop, skip and a jump from Boston, in Watertown, is the Commanders Mansion. When I was there for Stephanie and Wally's December wedding, they had the place decorated to a T, with so many details you just didn't know where to look. Such a hidden gem! When I lived in Beverly, I had no idea this was right next door in Danvers until I was lucky enough to shoot my first wedding there. From the historic house, to the gardens and farm, to the manicured lawns... You can't go wrong at Glen Magna Farms, especially for a spring wedding when the Wisteria is out. Gore Place is not only "the Monticello of the North," but also a working farm with goats, chickens and sheep. Not that I got to see much of that side shooting weddings there! It makes a spectacular backdrop with the mansion in the background, out on the lawn. 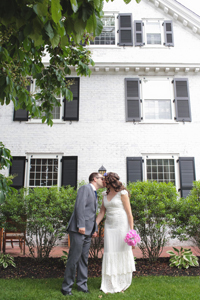 For Cori and Max's wedding, they chose to have their ceremony out on the front lawn, with the chuppah under the tree there. It was beautiful! And just wait until you get inside to see the rooms, which are decorated with period pieces. 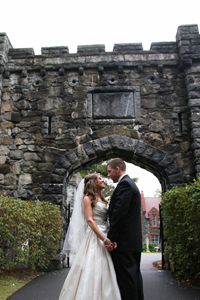 So much fun at Hammond Castle! Careful, you can get lost here. Truly a unique venue on the Northshore, in Gloucester. Not only is it a castle, but it's right on the water! Gorgeous views. You don't see many completely outdoor receptions (at least I don't), but the Lord Jeffrey Inn has the most beautiful spot on its rooftop for such an occasion (just hope for no rain!). 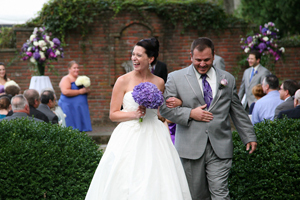 Katie and Chris had such a beautiful June evening for an outdoor wedding, and I was happy to photograph it for them. Absolutely love the outdoor fireplace. 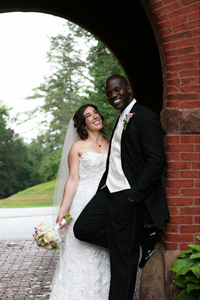 Yet another beautiful historic estate for a wedding in Massachusetts! It seems like if you throw a rock from Boston you might hit one. Anyhow, this has been one of my favorite estates... Sometimes the older places are kind of dark, but Lyman is light and airy, with big windows and beautiful colors. And then there's the grounds and gardens, really just perfection all around. 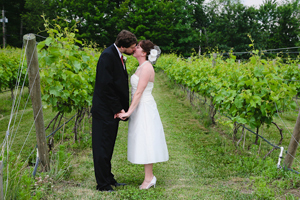 I love love love winery weddings. I briefly lived outside of Napa/Sonoma valleys in California, and I think that's when I fell in love! 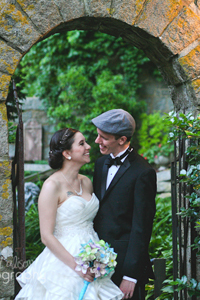 Being in New England, winery weddings are a little more rare, but Nashoba Valley Winery is a great spot, with an amazing dinner at J's Restaurant! This might be one of my favorites... top five, at least. 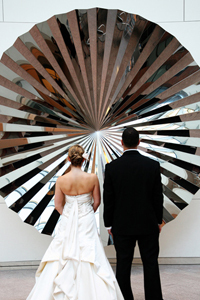 I mean, a wedding at an Art Museum, for an art geek like me... I'm in heaven. And the Peabody Essex has a little bit of something for everyone, with it's most recent renovations. Most people in Massachusetts visit Plimoth Plantation in fourth grade and then forget about it! But, it is a perfect wedding venue... 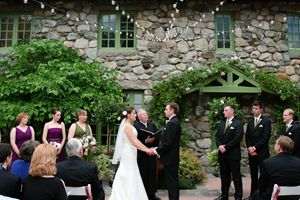 They have the beautiful gardens, the water, a barn... and tented or inside reception. Another one close to my heart... As my husband and I did our wedding photos in Salem, right outside the Salem Old Town Hall in Derby Square. You don't have to love all things Halloween (even though I certainly do) to love Salem! The Stevens Estate is actually right near me in North Andover, Massachusetts (I'm just over the border in NH), so I'm always happy to head over there! They have a beautiful set-up in the tent (chandeliers! 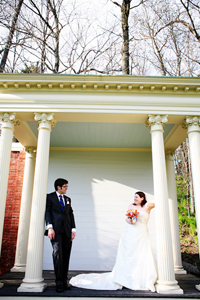 love it), and the woodland trails, the grounds and estate itself are beautiful backdrops. From their website: "Longfellow's Wayside Inn is proud to be the oldest operating Inn in the country, offering comfort and hospitality to travelers along the Boston Post Road since 1716." 1716! You can't get more historic than that. There are also lots of fun places nearby for a photographer! There's the classic New England schoolhouse, as well as the old Grist Mill, not to mention the gardens! A castle on a hill... In New Hampshire. Sure, why not! As you wend your way driving up the curvy and tree-lined driveway to the castle, it takes your breath away. It's really a unique place to have a wedding, and the combination of the ceremony with the castle backdrop with a beautifully tented reception just makes it so easy for a photographer! A little further afield, in Portland, Maine, is the Portland Company Complex. Unassuming on the outside, it has this raw modern factory loft feel inside. But it still feels pretty warm and cozy (especially with 200 of your closest friends and family). Another one further from Boston, but I couldn't leave it off this list - the Hotel Viking in Newport, RI. 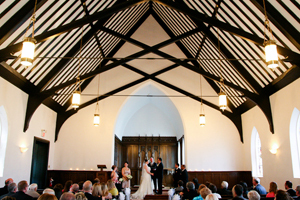 It very conveniently comes with its wood-beamed chapel for the wedding ceremony, and your choice of several ballrooms for the reception. 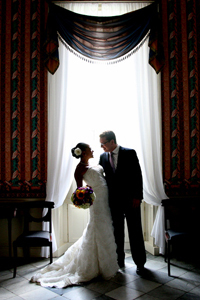 Everything about Hotel Viking is a photographer's dream! 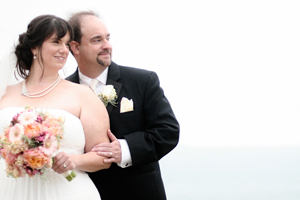 They take you on a little ride to the seacoast (or wherever around Newport) for photos, but at Kristen and Mike's wedding we did quite a few photos just around the hotel, and I certainly wasn't complaining!